Chutneys are perfect when served with a dash of spicy curries. Nothing can beat a nicely roasted piece of beef served with a delightful tangy and sour relish. Chutney and relish are often used interchangeably. Relish refers to a form of sauce of pickle that can be eaten with plain food to improve the taste and flavor. Chutneys are thick exotic sauces that mostly contain spices and fruits. Relish as recorded refers to a piquant sauce that can be served with plain food whose main purpose is to improve the flavoring. It is believed however, that the main aim of relish in the past was to preserve leftover vegetables to be used later during winter. The basic relish contains vegetable pieces chopped up, vinegar preferably white or lemon juice, salt, sometimes spices such as dill seeds, turmeric, mustard, curry powder and chili. Tomato, quintessential gentleman relish, piccalilli and chow-chow are among the most popular relishes in the world. In the US, relishes are used mostly on hot dogs, burgers and sandwiches. Relishes are mostly sour rather than sweet. However, the sweet variety exist and several recipes involve addition of fruits too. Chutney is a thick pasty like sauce that can be chunky. It is mostly made of fruits and spices and its origin is in India. The word chutney refers to an Indian tern, ‘chatni’ that means heavily spiced. 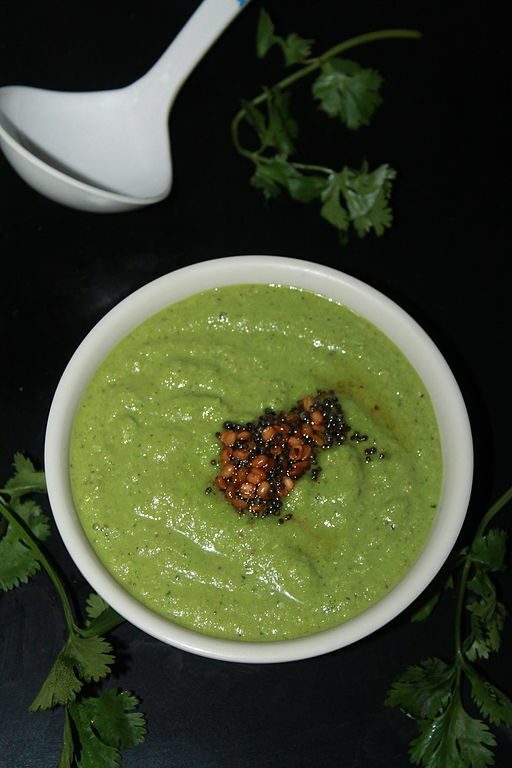 The basic chutney recipe includes fruits, nuts, vinegar or lemon juice, sugar, spices such as coriander, garlic, ginger, cumin, cardamom and tamarins. So, how is it eaten? Chutney was invented mostly to be eaten with different curries, but today many people use if for cheddar cheeses and sandwiches. Chutney can also be served as a dipping sauce for meats or on rice and potatoes. Relish is defined as a pickle or piquant sauce that can be added to plain food to improve the flavor. Chutney is a really spicy sauce made of mostly fruits and sometimes fruits, sugar, spices and vinegar/lemon juice. Chutney is much softer in texture. And less chunky especially when cooked. Relish sauce is chunky in consistency and may not contain any chunks. Chutney involves a slow-cooking process where the fruits used cook until really soft. Relishes consist of rather firm vegetables that can be slightly cooked or raw. Chutney contains fruits mostly while relishes are mostly made of vegetables. Chutney is originally from India and can be traced back to centuries back. It has been used India for centuries as a side dish cuisine. Relish is originally from England and is more recent than chutney. Chutney contains several spices. Relish may or may not have spices. Relish is not as sweet it has a tangy sour taste. Chutney is often sweet and sour due to the addition of sugar. Chutneys are served when fresh. Relishes are often meant to be [reserved and can last much longer than chutneys. Relishes and chutneys are all side dishes added to make food tasty. Relish is originally from England while Chutney originated from India. Chutney can be dated back to three centuries ago while relish only came up a century ago. 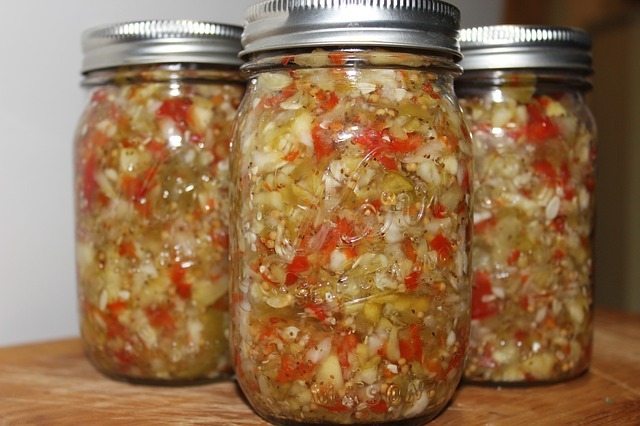 Relishes were originally used as a means of preserving vegetables to be consumed during winter. Relish will often contain more vegetables; however, a few recipes include fruits. Chutneys often contain fruits and loads of spices. Relishes often have a tangy and sour taste, while chutneys are often if not always sweet. This is because the later has sugar additives. Chutneys contain many spices while relishes often don’t. Despite the differences, both are great additions on a dinner table and if done right can take a simple meal to the next taste level. Evah Kungu. "Difference Between Relish and Chutney." DifferenceBetween.net. 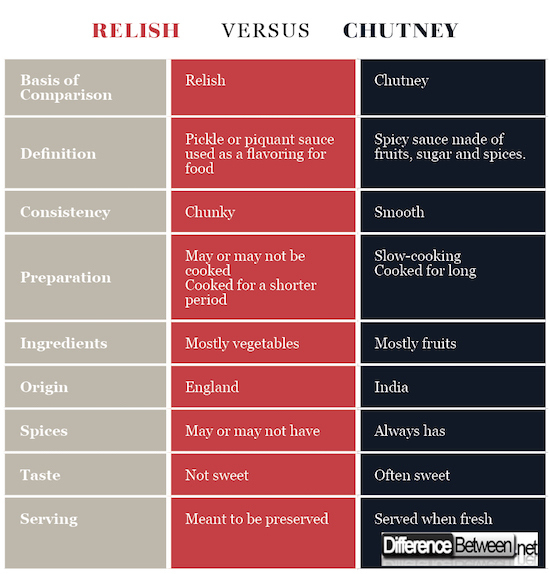 May 15, 2018 < http://www.differencebetween.net/object/comparisons-of-food-items/difference-between-relish-and-chutney/ >. HOBSON, J., & Watts, P. (2012). Making Traditional and Modern Chutneys, Pickles and Relishes: A Comprehensive Guide. Crowood. Atkinson, C. (2011). Home-Made Pickles, Chutneys and Relishes: A Practical Guide to Making Delicious Preserves at Home, with More Than 85 Step-by-step Recipes and 300 Photographs. Anness Publishing. Collective, M. (2013). Sundays at Moosewood Restaurant: Ethnic and Regional Recipes from the Cooks at the. Simon and Schuster.